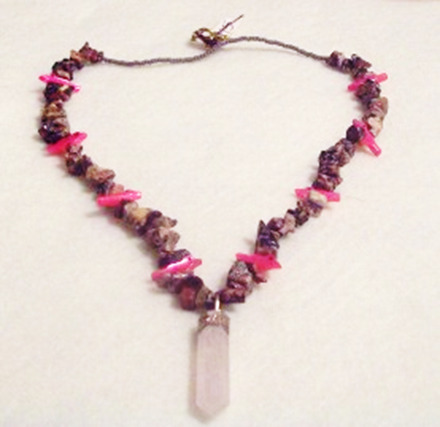 Amazing Crafty Artist: Meet Debra Davis and her Handmade Gemstone Necklaces. Did you know gemstones have meanings? Handmade Gemstone Necklaces and Safety Pin Lapel Pins: What does it mean? Each week, we feature an amazing crafty artist or blogger. This week, I'd like to introduce you to Debra Davis. Debra is a local artisan from my home state of Indiana. She's been handcrafting beaded necklaces, lapel pins, and other jewelry for fifteen years. If you live near Michigan City, you can contact her to design something special just for you. 219-879-1429 Did you know gemstones have special meanings? Safety Pin Lapel Pins with precious gems. Handmade Beaded Necklace with Real Gemstones. Amethyst: Aids in calming the mind and obtaining wisdom. It is said to ease obsessive compulsive behavior. Aquamarine: Gives courage and aids in mental clarity. Emerald: Aids in fertility, gives psychic powers, believed to lift insomnia and depression. Garnet: Passion and devotion. Good Luck in business ventures. Sapphire: Peace and happiness. May help in predicting the future. Beautiful turquoise and cobalt gemstone handmade bracelet. If you are looking for a unique, thoughtful gift for a special occasion, Debra's handmade jewelry is a perfect choice for a one-of-a-kind original. Most necklaces are priced at $14.99! Although she's been crafting and selling for years, she's only recently introduced her work to the online community. She'd be tickled if you popped over to take a look. Each piece is crafted with love in honor of her late son, Jasyn. I especially like the macrame bracelets. You might also like Fair Trade Jewelry. 10 Ways to Make and Sell Hand Made Jewelry: Quick and Easy Methods Anyone Can Use Today!